뉴욕에서 활동하고 있는 트랜스젠더 운동가 폴린 박(Pauline Park)씨와 함께하는 연대토크! 성소수자와 입양인으로 차별과 억압에 맞서 온 폴린씨와 이야기를 나눌 수 있는 특별한 시간을 준비하였습니다. 성소수자 운동 뿐만 아니라 팔레스타인 점령에 반대하는 뉴욕 퀴어들NYC Queers Against Israeli Apartheid(QAIA) 활동도 계속해오고 있는 폴린씨가 직접 팔레스타인에 다녀와 그곳의 퀴어들과의 연대와 성소수자들을 이스라엘의 국가 이미지 세탁에 이용하는 핑크워시에 대해 이야기 합니다. 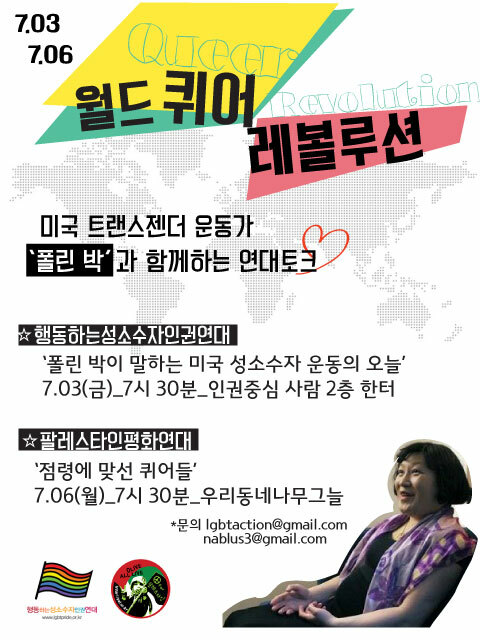 NYC based gender rights advocate Pauline Park is here in Korea to share her thoughts and experiences. As a transgender and adoptee she has dedicated her life fighting against discrimination and oppression. Also as an activist of NYC Queers Against Israeli Apartheid(QAIA) she hasbeen raising her voice against Israeli occupation and visited Palestine. She will talk about queers in Palestine and Pinkwashing in Israel.